Today's travel trailers, fifth wheels and motorhomes can include everything from satellite television and central air conditioning to built-in electric fireplaces. However, these RVs have one major disadvantage; they require large amounts of electrical power to operate. RV Solar Panels can help you produce some of this electrical power, for free. The solar panels take the energy from the sun and convert it to electricity for you to use regardless of where you are. Your motorhome, travel trailer or fifth wheel can be limited by its onboard battery capacity which will quickly be run down when powering these larger loads. These large RVs require a generator to power their major appliances and air conditioning loads when not plugged in at an RV park. The problem with a generator is that is can be noisy, and if your looking for the peace and quiet of the great outdoors, you don't want a generator chugging away in the background. An RV Solar Electric Panel can help you with this and let you run your appliances when not plugged in at a park, this is also silent, free and environmentally friendly. The panel will normally be mounted on the roof or truck bed, and many companies sell a RV Solar Electric Kit that can make the installation of the panels easier. Some kits are also specially designed for your make of RV. * A panel, which size depend on how much power you need. A mounting kit for the roof off your RV. * A solar electric panel controller for regulating the charge from the panel to the batteries. 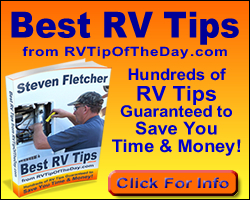 Naturally you will have to take a look at how much power all you appliances need, what type of RVing you do, for example do you spend all your time away from a hook up point or just some of the time. This will guide you to a kit that will provide you with enough electricity through solar energy for all your appliances. Another option that you could use along with the panels is to buy a portable wind generator that will help to provide you with power for your motorhome, travel trailer or fifth wheel. The same options can be used to provide solar electrical power to your boat or yacht.